Our sincerest thanks for your interest in our Porus® One. 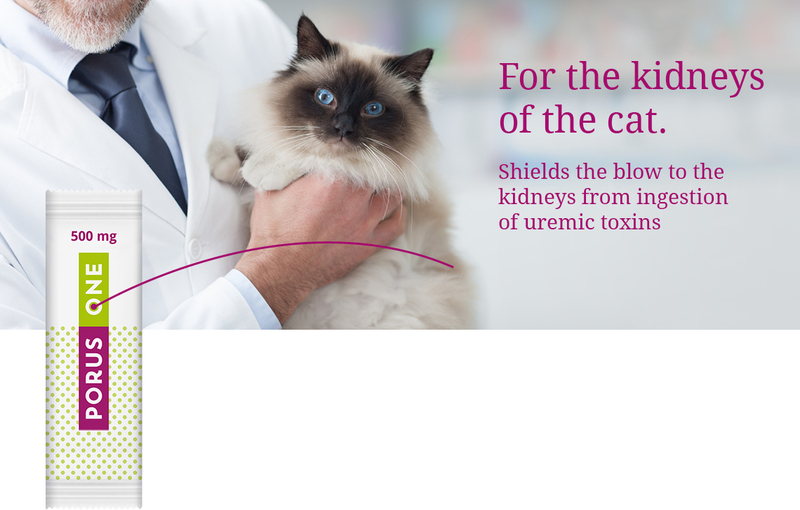 Porus® One is a product for the kidneys of the cat. Porus® One contains the a.i. Renaltec®, a selective adsorber with a huge capacity to adsorb the precursors of uraemic toxins aleady in the intestine and excretes them naturally with the feces. Porus® One is orally administered and is not adsorbed or metabolised. The total quantity of precursors bound and subsequently excreted by Porus® One can‘t anymore be transformed into uraemic toxins like indoxyl sulfate and para-cresyl sulfate. Binding these precursors of uraemic toxins supports the kidney health. Porus® One was developed by veterinarians and is manufactured in Germany. 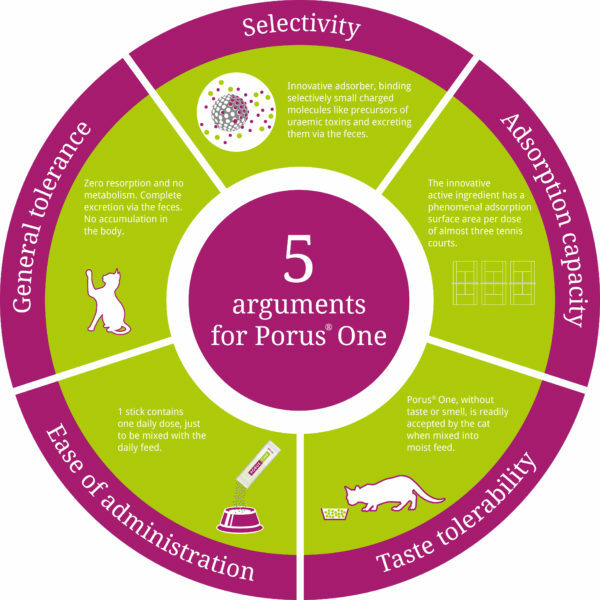 Since February 2018, Porus® One is available for veterinarians in Austria and Switzerland. Now we want to provide you the most essential information. Uraemic toxins are frequently natural waste products, generated daily by the natural protein metabolism. They are usually excreted via the urine. There are a number of uraemic toxins. Most important are indoxyl sulfate and para-cresyl sulfate. Since indoxyl sulfate is generated by the essential amino acid tryptophan, it can´t be prevented by simple protein-reduction in the feed. Similarly, para-cresyl sulfate is generated by tyrosine and phenylalanine. Porus® One targets the binding of precursors of those uraemic toxins already in the intestine and their elimination via the feces. Felines are carnivores and need a high portion of protein in their daily diet, so of course a cat´s metabolism and enzyme systems are adjusted to high protein digestion. If protein supply discontinues for a significant period of time, self-digestion of muscle tissue may begin, which underlines the importance of adequate protein supply. However, with the decomposition of proteins and modification of amino acids by the gut flora, inevitably uraemic toxins are generated, and must be excreted via the cat`s urine. For example, the disintegration of tryptophan leads to the precursor indole, which usually is adsorbed in the intestine and transferred to the liver, where it is transformed into indoxyl sulfate. The indoxyl sulfate arrives at the kidneys via the blood and is excreted via the urine. Binding the precursors of uraemic toxins like indole and excreting them via the feces supports the kidney health. Porus® One contains the a.i. Renaltec®, a physically-acting selective adsorber for precursors of uraemic toxins in the gut. 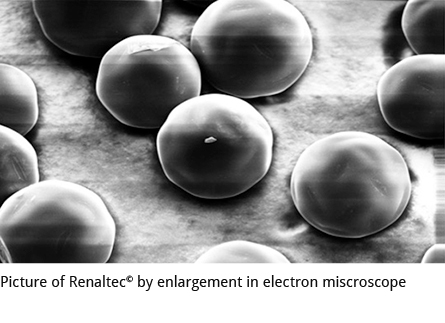 Renaltec® is composed of tiny, black, rigid spheres with diameters of 0,1 to 0,3 mm. They are characterized by a smooth surface, perforated by numerous pores leading to a branched channel system similar to the bronchial system. The very smooth surface assures an unimpeded passage “rolling” through the GI tract, neither adhering to the mucosa nor accumulating in the intestine. The size of the pores is determined during the manufacturing process. The pore size is so small that only molecules with a diameter exceeding 2 nm can enter the sphere‘s interior. Uraemic toxins are just such small molecules. Particles exceeding a diameter of 2 nm (like vitamins, cells or enzymes) cannot enter. Subsequent binding of the substances to the interior of the sphere is due to physical forces. How does Porus® One act? 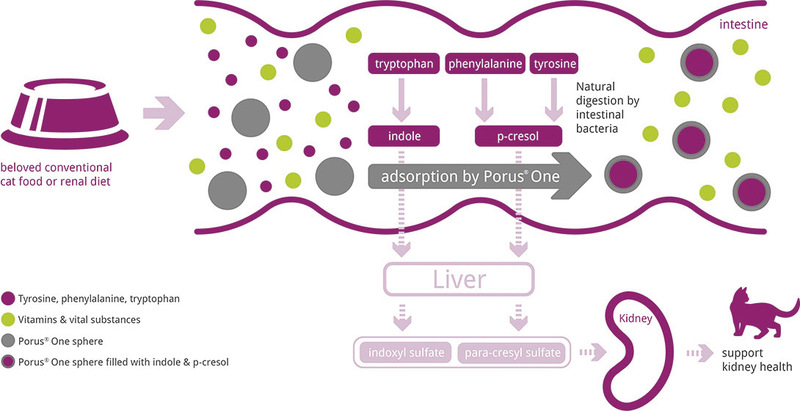 Porus® One is a selective, heavy-duty adsorber capturing precursors of uraemic toxins in the intestine, therefore preventing their conversion to uraemic toxins. Binding this precursors of uraemic toxins supports the kidney health. Porus® One acts by physical action: the active ingredient, Renaltec®, has an outstanding, specific adsorption affinity for small molecules with the relevant electrical charge. The tiny spheres show on their surface a huge number of specifically-designed pores. Their size allows precursors of uraemic toxins like indole and p-cresol to enter the inside of the sphere and to be bound there. Inside the sphere, the precursors of uraemic toxins are bound by their electrical charge finding an opposite charge in the interior of the sphere. The surface area available for adsorption of a daily dose of Porus® One corresponds roughly to that of of three tennis courts! 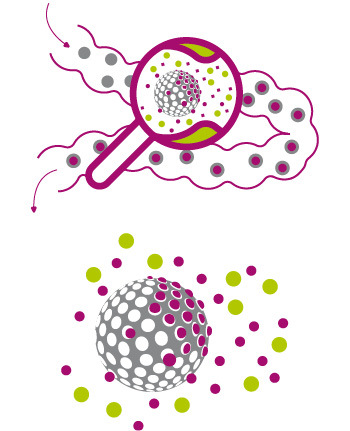 TIPP: The electrical charge of the Renaltec® spheres is a key determinant of their activity! Porus® One, with its load of precursors of uraemic toxins, is completely excreted in the feces. It is neither metabolized nor adsorbed and therefore does not burden the cat`s metabolism. 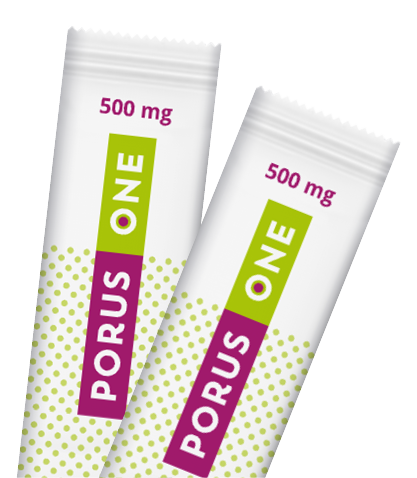 Porus® One does not accumulate in the body. 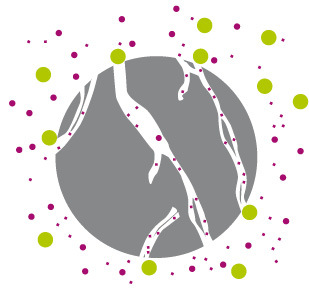 Renaltec® spheres attract precursors of uraemic toxins, which pass through the pores to the sphere‘s interior. Large molecules such as vitamins cannot penetrate. Renaltec® spheres shown in a side-cut. Only small molecules – like the precursors of uraemic toxins – can enter the inside of the spheres via their pores. They are bound there by their electrical charge. Porus® One is taken up by the cat in a daily dose of 500 mg/cat/day. 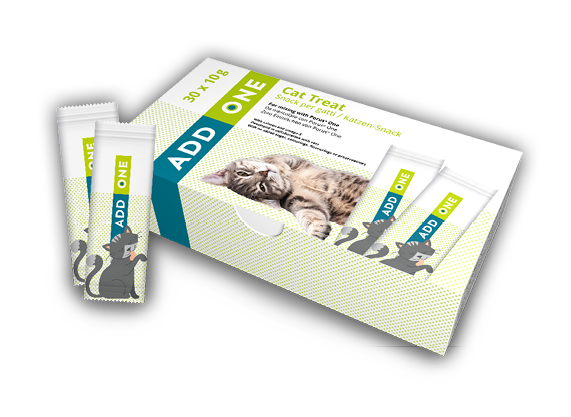 Just empty the contents of one stick over the standard moist diet or any kind of specific diet your cat likes and mix it in the moist feed. 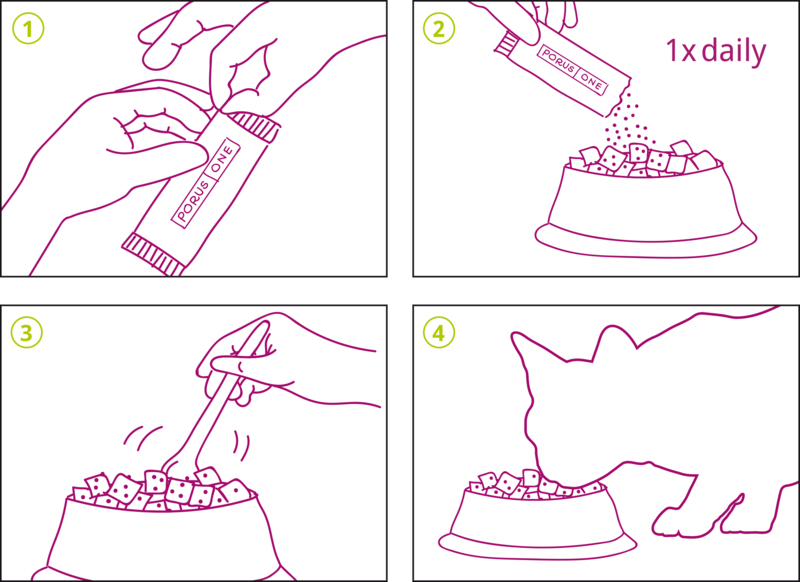 Owners who feed dry feed exclusively to their cat, must mix Porus® One in a small quantity (tea spoon) of moist food or cat paste like Add One© and let it be consumed by the cat before giving the cat its normal dry feed ad libidum. Porus® One has no smell or taste and is well tolerated in the feed. The sticks may be easily opened at the upper part.